Matching Dragoons: Jonah Hex #42 "Wanted for Murder!" Jonah Hex #42 "Wanted for Murder!" Our 3-part epic tale starts with a band of outlaws stealing sheep and Bart wearing Jonah's hat and coat. They are gloating about how great it was to see Jonah swinging from that cottonwood tree after they clobbered him in the head. As they continue to gloat, a noose is lowered from a tree and snags the outlaw in the back of the pack. The rest of the bandits hear their compatriot choking and they turn just in time to see Jonah jumping out of a tree above them. 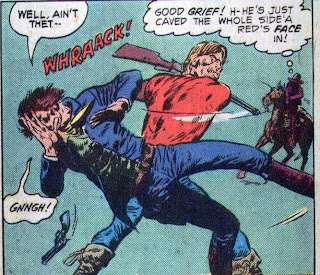 He knocks out Bart and stabs him then grabs a rifle to face off with the remaining two outlaws. However the rifle is out of shells and Jonah has to use it like a baseball bat. The last outlaw, "Sugar" Wallace turns tail and runs. Jonah packs up the three that he caught and heads into town to get his bounty. In town, Jonah meets up with Mayor Bilgewater and two other business men, John & banker Bill Jeffries. The mayor explains that it was their good fortune that Jonah happened by after the sheriff was gunned down by Wallace. Jonah decides to drop the bodies off at the undertaker and get himself some breakfast. Jonah leaves and the three men go inside. Once inside they encounter Sugar Wallace himself. They rant at Wallace saying that they hired him to run off sheepherders so they can buy up the land cheap. The discussion escalates into a verbal fight while the Chinese man servant serves drinks. Wallace says that he didn't hire on to go up against Jonah Hex, but he can find some more men so the Mayor and the others can buy the land to sell to the railroad when the new spur comes into town. Later that night, Jonah is washing up before turning in for the night. There is a knock at the door. It's Caroline, a saloon-girl that Jonah met earlier and she is wondering if she can come in. Jonah suspects a trap and rightly so. Wallace is outside the door with three other men. Jonah props a chair against the door and blows out the lamp and then tells Caroline to come in. When Wallace's men try to open the door they find it blocked. Wallace blasts the door open and they find the window wide open. Just then, Jonah, standing on the porch roof outside the window, tosses in several sticks of lit dynamite, blowing Wallace and the three men clear to hell. Following what? Minute, day, hour, week? Heck, let's go with day. Our trio of terror are lamenting the loss of Wallace but they have a backup plan. 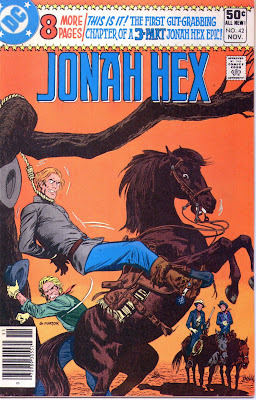 A U.S.Marshall named Jeremiah Hart is probably the only man that can kill Jonah Hex and they plan to get him. We then cut to Jeremiah Hart hiding behind an ore cart, trying to flush out a killer holed up in a mine. The killer is holding a woman hostage after murdering her husband. Hart starts pushing the ore cart towards the mine, using it for cover. The killer grabs some handy dynamite, slaps the crap outta his hostage, lights the boomstick and throws it at the cart. The cart explodes and Hart jumps out from alongside the mine and shoots the gun out of the killer's hand. The woman hostage asks why Hart doesn't kill the man and Hart explains that it the hangman's job, his is to bring the killer in. The woman starts crying about her poor husband and Hart rides off with the killer in tow, leaving her at the mine. Three days later Hart is coming home to his Aunt Gerry and Petey. It isn't clear if Petey is his son or his younger brother since Petey always calls Hart "J.D.". Anyway, Hart has the killer in tow and locks him up in the woodshed while they all have dinner. After dinner, Hart takes food out to the killer and then Petey asks to have Hart do a trick for him. Petey takes four silver dollars and throws them in the air. Before they hit the ground Hart manages to shoot all three of them dead center. Petey exclaims that nobody else in the whole world coulda done that, but Hart says that there is one other man, a bounty hunter. Jonah helps her down from the wagon but she has broken her leg when the wagon threw the wheel. Jonah carries her to a nearby farmhouse while they recap their failed relationship. Mei explains that she is going to visit her brother who lives in Feldon's Gap. Once at the farmhouse, they are invited in and Jonah lays Mei Ling onto a bed. Jonah starts to tell her that he loves her but she says that he actually loves the tenderness that is hidden deep within himself that he doesn't want to see there. Jonah says he knows that is what she said last time, but he truly loves her. Mei Ling reminds him that she could never love him as long as Jonah follows this life of violence and Jonah says that he will quit bounty hunting if only to have Mei Ling be his wife. She says that she will think about it. Meanwhile, the trio of evil business men in Feldon's Gap are still working on their scheme to get Hart to hunt down Hex. Their plan involves framing Hex for murder (because that has been so successful in the past) and they pull pistols out and shoot banker Jeffries, thus having a crime to frame Hex for and allowing for a profit split of two ways rather than three. Several hours later, Jonah rides into town to fetch a doc for Mei Ling when the Mayor runs out and explains that one of Wallace's men rode into town, robbed the bank and killed Jeffries.. Jonah says he'll drop the doc off and then hunt down the killer. Back at J.D. Hart's place he receives a telegram from Feldon's Gap saying that they need him to hunt down the man that just robbed the bank and killed banker Jeffries. They want Hart to bring in Jonah Hex. Jonah's Injuries - Prior to the start of the story he was clubbed and hung. 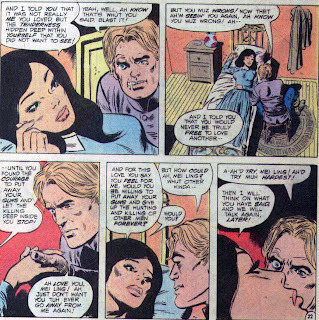 Timeline - This obviously takes place "more than a year" (according to Mei Ling) after issue #23, but there is no date given. Until we can backtrack a date, we'll just say this one is about 1874 or 1876. One of those. I know it's not 1875, because nothing happened to Jonah Hex during 1875, right? This is the start of a three part story and the beginning of a story arc that lasts almost 50 issues! From here on out, each story builds on the one prior to it (except for a filler issue or two) and this can be a good thing or a bad thing. Ongoing stories are something I enjoy but at times throughout the remainder of the series it almost got way too much like a soap opera. But it also allowed for growth in Jonah's character that couldn't have been done without it. So was Mei Ling the best thing to happen to Hex or the worst? I'm divided on the whole topic and I'll recount the whole thing as we go along and let you decide for yourselves. Of course, the next several issues is going to drive some people nuts. On a side note, I do not enjoy Forton's work. Jonah looks waaay too scrawny and the quality in the panels isn't very consistent. 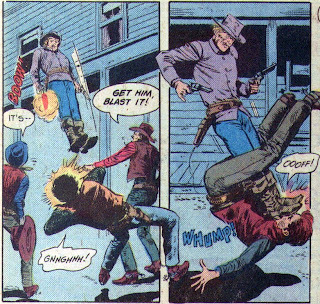 It looks too much like artwork in the old Charlton westerns from the 60's. Next Issue: Captured by Hart, burned at the stake, and almost drowned!! Oh, and a Kubert cover to boot. Nice to see that you're back! I hope that you had a nice vacation. As for Mei Ling, she has always driven me nuts. All she ever did was try and change Jonah, and nag and whine and run off with other men and stuff. I had a great vacation. As for Mei Ling, wasn't she just doing what all women do? 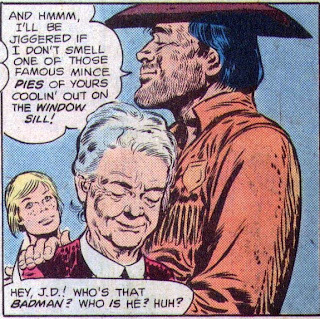 Well, if Frank Miller was writing Jonah Hex, I suppose that she would have ended up in a brothel.